Foxin' Wins from NextGen Gaming (NYX) is the first in its duo of games based around the fantastic and mega-rich Lord Fox – with the sequel being Foxin' Wins Again. Mr Fox is a crafty social climber who has spun himself some seriously lucrative business deals and become lord of the manor. By all means he's something of a flashy aristocrat, as he struts around his plush country mansion. Developed using NextGen's advanced five-reel and 25-payline setup, this slot brings you immersive features, 2,000 coin jackpots, sly super-bet gambles and a highly aesthetic slotscape. Whether Foxin' Wins has been inspired by the book Fantastic Mr Fox or celebrity TV characters like Basil Brush (he of 'boom boom' infamy), NextGen Gaming has created a great looking 3D game that's seriously crafty. Our bushy-tailed friend has used all his slyness to become Lord Fox, and shows off his golden stately home over a five-reeled, 25-payline slotscape. The exuberant Lord Fox is seen jumping over his red velvet chair as an array of icons spin on the reels. These include Wild Lord Fox, 9, 10, J, Q, K and A, bundles of money, valuable globes, Lord Fox's mansion and Mrs Fox's sports car. What's more, there are leprechaun pots of gold Scatters for free spins, plus fox pup bonus Wilds with escalating super bets. With exciting sounds, non-stop action, 2,000 coin base game jackpots and 95.3% return-to-gamer, Foxin' certainly wins on all levels. Landing three or more Pot of Gold Scatter icons triggers 10 free spins, with more Fox Pup Wilds boosting payout potential. Your wins are doubled and free spins can be re-activated for up to 20 free goes. Foxin' Wins delivers a random slot bonus – either the Fox Fund or Leprechaun Shakedown, which both win you lucky payouts. You'll need Lord Fox to chase down the mischievous leprechaun to get a payout. 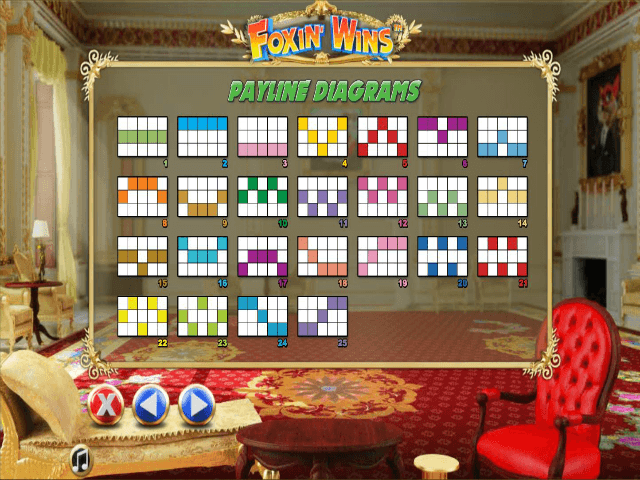 What's more, you can select gamble in Foxin' Wins to scoop up to five times your stake. Super betting can really boost your winning chances, but it also eats into gaming budgets – so use it when your luck's in. The fantastical verdict: NextGen's Foxin' Wins slot is a fun, great looking 3D slot that's loaded with action and gaming decisions that let you influence your strategy and luck. If you like Foxin' Wins - You'll like these slots too!